By Wm. Stephens & Sons Ltd. Stores Ref. 22c/167 (Goggles), 22c/113 (Screen, Anti-Glare). The frame is in excellent original condition, undamaged and with virtually no paint loss whatsoever. The nosepiece leather is excellent and the chamois backing has average soiling. Unsurprisingly, the original rubber face pads have deteriorated and are hardened and a bit squashed/flattened - particularly the upper pads. Fitted with very good clear glass lenses (note that the outer right is cracked). The strap components are also very good - the springs are excellent, undamaged 'loops' and clearly marked leather section with manufacturer's details and reference numbers etc. The flipshield, or more correctly 'Screen, Anti-Glare' is fitted with the small enclosed type spring mechanism. The screen is a bit scuffed/marked but this might polish out if required. Complete with the original box of issue which although soiled is in good condition. 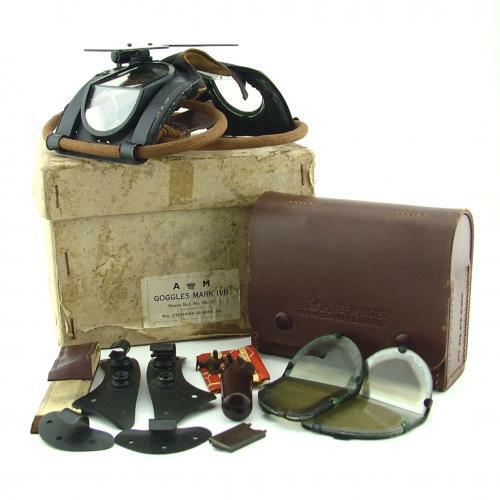 Normally these goggles are found with the card spares box but this set has the far superior leather case. This contains spare tinted lenses (some delamination), a bakelite tube of “Everclear”, frame key/spanner and a full set of helmet plates and poppers - all excellent. These could be attached to B or C-type helmets using the copper rivets also included. Finally there is the leather/chamois forehead protection strip. A very good to excellent set of goggles complete with all accessories. Stock code G20255.